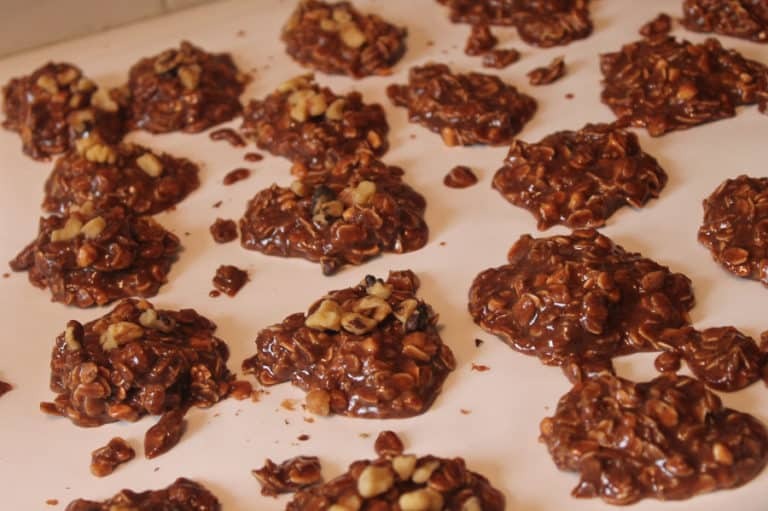 These Espresso Walnut No Bake Cookies take me back to my childhood. 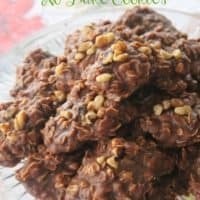 When I was growing up No Bake Cookies were a staple in the house. At the very least, a couple times a month, out would come the peanut butter, oatmeal, and cocoa powder. 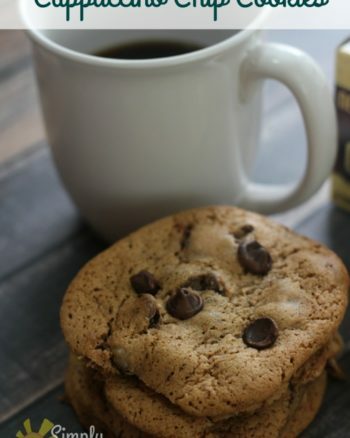 Waiting for them to set up was excruciating and I would sneak gooey pieces off the waxed paper whenever I could until I got a couple solid cookies and a cold glass of milk- oh heaven, they were soooo good. 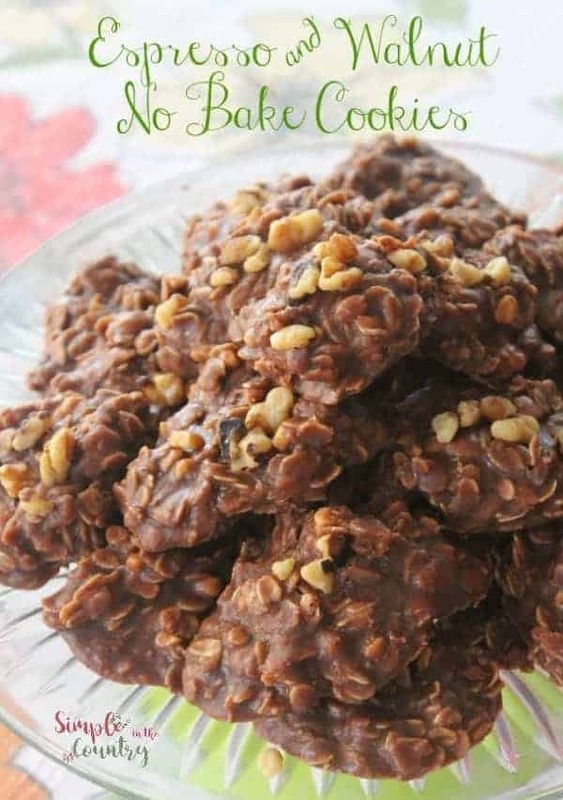 I still love the original no bake cookies recipe and don't normally mess around with perfection but I felt like I could keep the original flavor and add a little something that would make it even more grown up- What's more grown up than coffee? 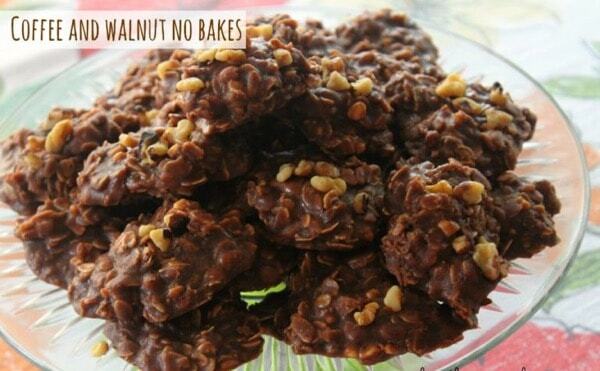 I also love nuts and sneak them into many baked good recipes so in went those too. I love how they turned out, and even the kids gobbled them up as usual, I hope when they are grown they too have fond memories of their mama making no bake cookies too. Give this recipe a try, you won't regret it! Lay out your waxed paper, wherever you want your cookies to cool and set. 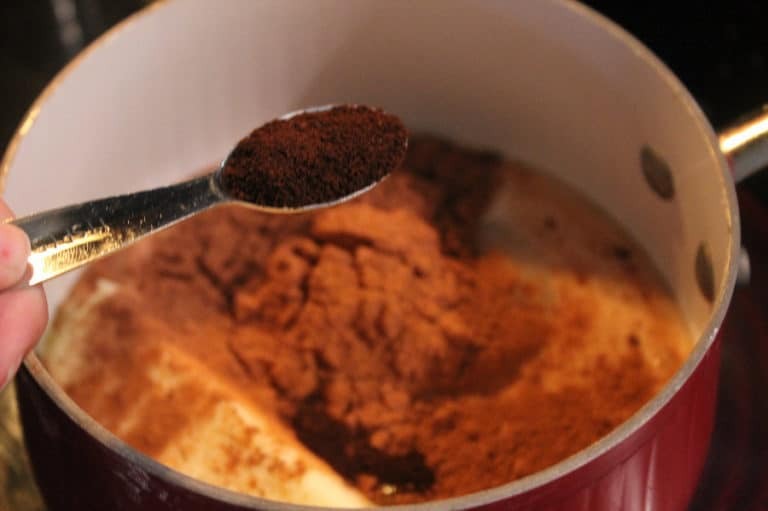 In a large saucepan combine milk, sugar, butter, coffee, cinnamon and cocoa powder over medium heat. Stir occasionally until mixture begins to boil- boil for 1 full minute. 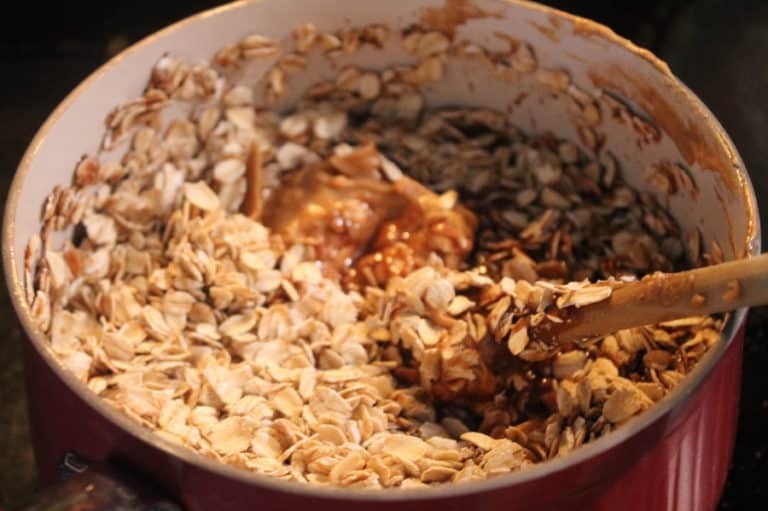 Remove from heat and stir in peanut butter, oats, walnuts, vanilla extract, and walnut extract quickly until combined well. Scoop generous spoonfuls on waxed paper, to identify that they are walnut I pressed a few crushed walnut pieces into the tops while still wet. 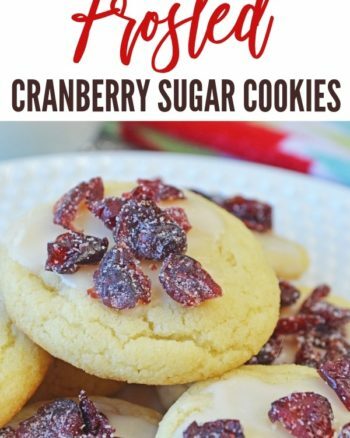 (This is very helpful for bake sales or when you are taking them to share with a group). Allow cookies to set until firm. Once your cookies are completely cool you can store then in an airtight container in refrigerator for 3-4 days (if they last that long). Stir occasionally until mixture begins to boil-boil for 1 full minute. Scoop generous spoonfuls on waxed paper, to identify that they are walnut I pressed a few crushed walnut pieces into the tops while still wet. Once completely cool you can store your cookies in an airtight container in refrigerator for 3-4 days. Calculations are just an estimate. Please run through your favorite nutrition app.